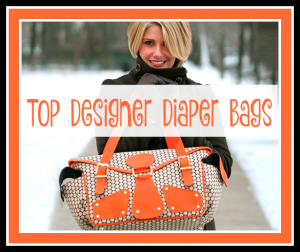 Top Designer Diaper Bags Add to Flipboard Magazine. New moms today want Top Designer Diaper Bags because they don’t want to lose their stylish self just because they had a baby. They don’t want the old fuddy duddy looking diaper bags that their moms carried. Who can blame them? With fashion being so important, even new moms deserve to stay up with fashion in the bags they carry. But they need a bag big enough for two now. Moms have to carry so much for those “just in case” moments. I remember those days. Designer Diaper Bags have everything they need. It has the space, with pockets and compartments for everything essential for little ones. But it looks like a really nice, high end designer diaper bag on the outside. These diaper bags won’t be used for a day or two or even a month. They will carry this designer diaper bag with them everywhere they go for at least 2 years, maybe more. Why would you skimp on something you will carry every day? You wouldn’t. So find the perfect designer diaper bag for you. There are several good choices here. Look at the bag that is featured here. 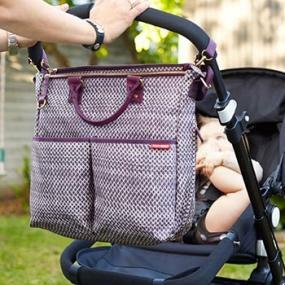 It is from the design firm called Petunia Pickle Bottom and they make designer diaper bags that moms can work with. They have great colors and great lines and are easy on the eyes. This one can be held with the two straps that you see or can become a backpack as quick as a blink of an eye. Having the option to wear it like a backpack at times is amazing. You don\’t have enough hands to fight with a baby and a bag. It has a water resistant lining, which is important for all the things moms carry, clean and unclean. It has four bottle pockets, large organizational pockets, a zipper pouch and a key clip so you will not lose your keys again. There are 30 colors and patterns to choose from, so if you like this designer diaper bag, check out all the colors it comes. Now tell me this is not more like what you were looking for? Let me show you more. Kate Spade is a fashion icon designer when it comes to classy stylish handbags. It just makes sense that she would have a designer diaper bag as well. 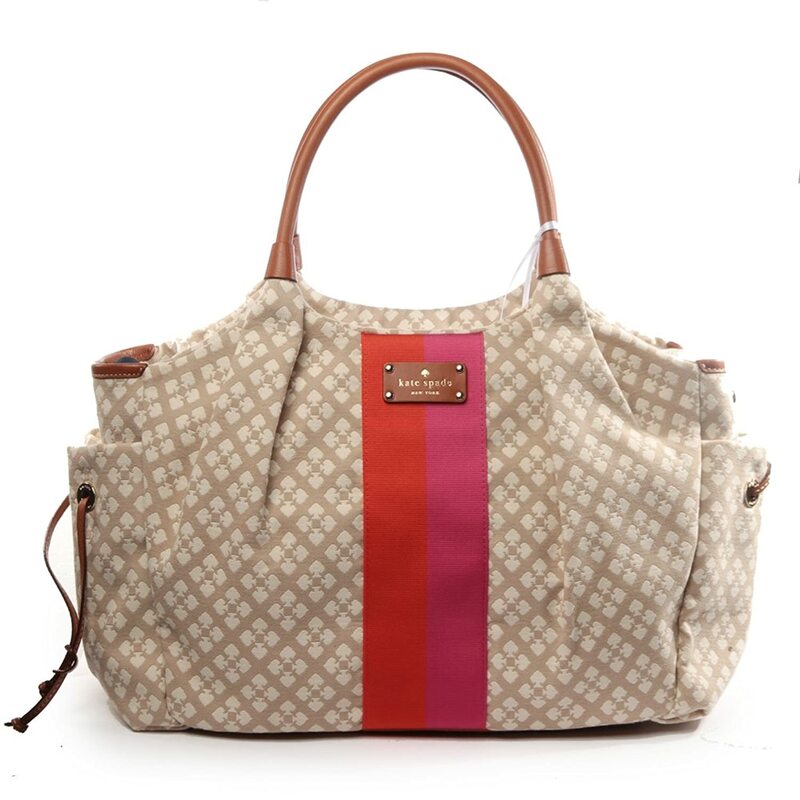 This diaper bag is cotton canvas with leather trim and it is imported. The interior is lined to be water resistant with a zippered pocket and 5 open slip pockets to drop things into, like the pacifier. There is a large leather rectangle on the bottom so it can stand up. It is embossed with Kate Spades logo. 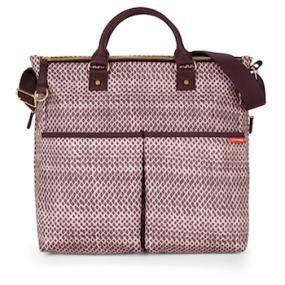 This is roomy enough to be used as a diaper bag, but fashionable enough to be used as your purse. 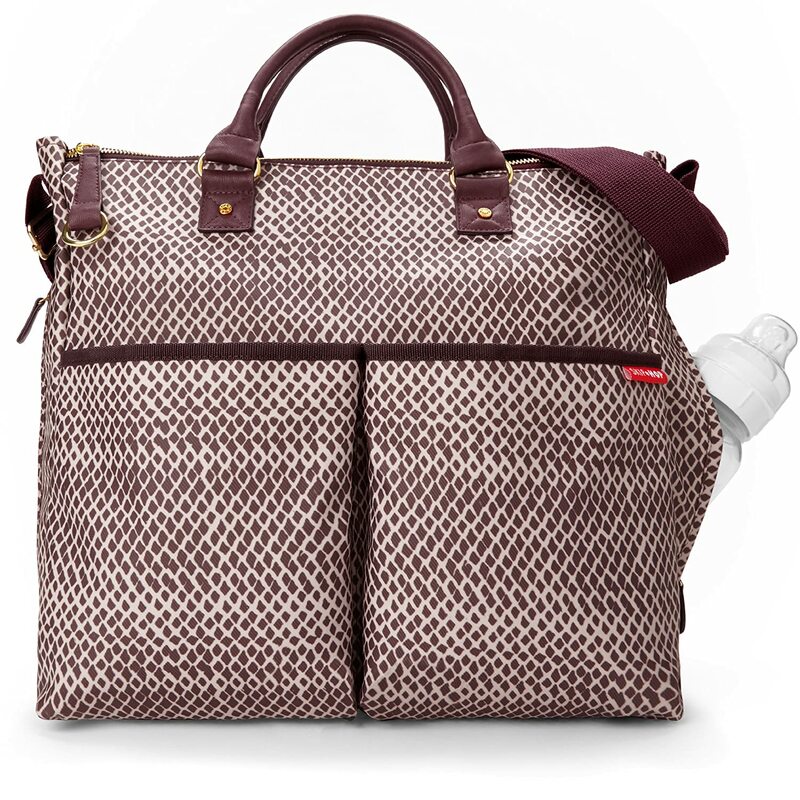 This Timi & Leslie Hannah designer diaper bag is precious. 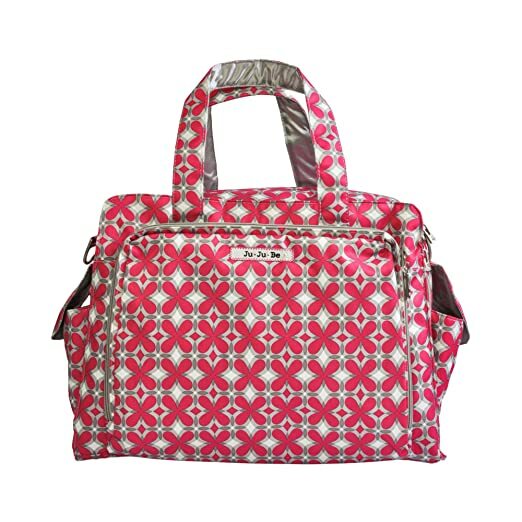 With 4 different colors to choose from and loads of extras, this could be your diaper bag. There are 7 pieces to this set: the diaper bag, changing pad, clutch, insulated bottle tote, matching stroller straps, and a zippered sac. It features cross body, adjustable detachable strap so you can wear it hands free. That will come in handy. It has a front mesh pocket where you can store your diapers, wipes and creams when you need to make a quick diaper change. One of the pieces is a stylish clutch that you can use as your purse that matches the Hannah Diaper Bag. There is a insulated bottle tote to keep your baby’s bottles warm or cool and a zippered sac to put away soiled clothes. The inside is water resistant with light colored lining so you can easily see everything in your bag. With two exterior side pockets, six interior organizational pockets, and an inside key fob so you will never lose your keys. This bag is designed to withstand anything you and your little one put it through and then some. 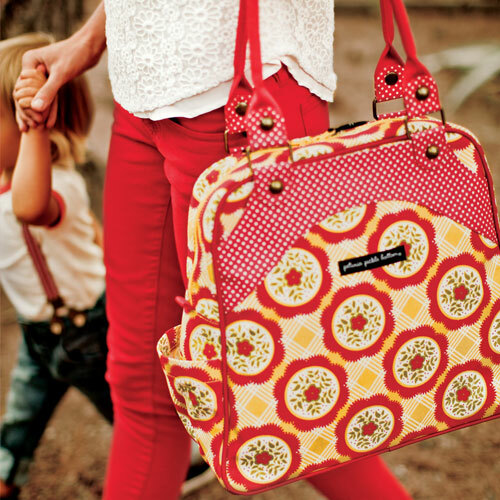 Can you imagine a diaper bag that still looks great after the kids and can then be used as a cool bag just for you? This one will do that. There are 3 different designs for this bag. Butterfly Spring, Candy-Striped, and Rosebud Fairytales. It is designed to look like a vintage bag, which I love anything vintage. It features two main zipper pockets that open up to reveal a multitude of well-organized pockets and compartments, an insulated removable bottle holder to keep liquids hot or cold, a water repellent wet zipper pocket for damp items, and a removable compartment with various pockets that is ideal for baby food jars or lotions. With roomy internal side pockets that are great for toys, diapers and extra clothing and external pockets that are great for stowing away items for quick access such as smartphone, keys and pacifier; it really makes this an awesome diaper bag. This is an amazing bag. You will never get tired of carrying it. Once the baby is old enough that you don’t need a diaper bag anymore, carry it as a computer bag or brief case. This bag is huge! It is bigger than most diaper bags. So besides the usual diapers, bottles, and everything else you will be carrying, you also have room to carry your iPad and your phone safely. It is waterproof inside and out. The changing pad is machine washable. It has 4 interior pockets, 1 zippered pocket, cell phone holder, 2 exterior pockets, zip in and zip out insert. It comes in 9 delicious colors as well. It’s fun, stylish and oh so beautiful. This great bag is divided into three compartments making it a great bag for moms with multiple children or for keeping moms things separate from baby things. This bag features a cross body, adjustable detachable strap so you can wear it hands free whenever you need to, a specially designed changing pad with a front mesh pocket where you can store your diapers, wipes and creams when you need to make a quick diaper change trip, a zippered sac to put away soiled clothes. They even include a stylish clutch that you can use as your purse with interior credit card slots and an inside zipper pocket. Of course there is the normal stuff like a insulated bottle tote to keep your baby’s bottles warm or cool, and matching stroller straps so you can hang your bag from your stroller. This is another great example of a designer thinking of everything we might need in a diaper bag. Of course, these are beautiful, and there are lots of color choices. But check out the video to see all the great features. I think my favorite features of this bag are the Teflon coating on the inside and out. This bag is machine washable, how perfect. It has another feature I haven’t seen yet, a crumb drain. Just push the crumbs out the drain hole when you make a mess in the bag. They color coded the tabs on the zippers so you can find what you want without opening every pocket. What a great idea! 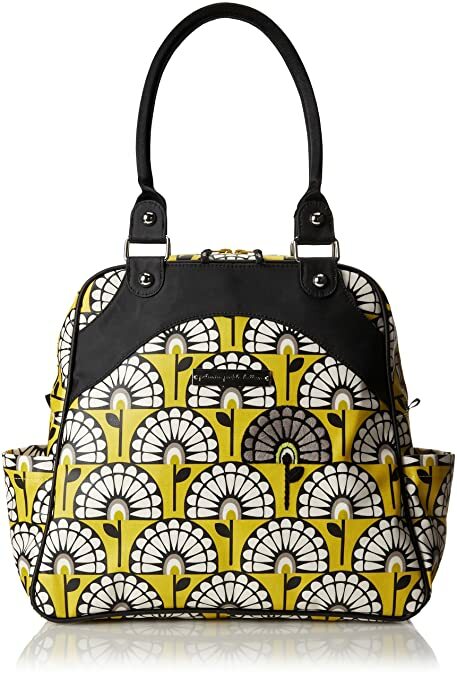 A wonderful contemporary pattern for your diaper bag. It really doesn’t look like a diaper bag at all. As with all the Duo Diaper bags, the changing pad is included. The magnetic closures on both the exterior bottle pockets and a zip on the main compartment ensure everything stays in its place. An interior bottle pocket and two side pockets keep diapers, bottles and parent must-haves organized while out and about. Plus, the wipe-clean surface helps protect against any small spills or dirt that may come your way. This has the straps that convert into a stroller hanging diaper bag. Perfect for those days that you have the stroller out. Well, there ya go. 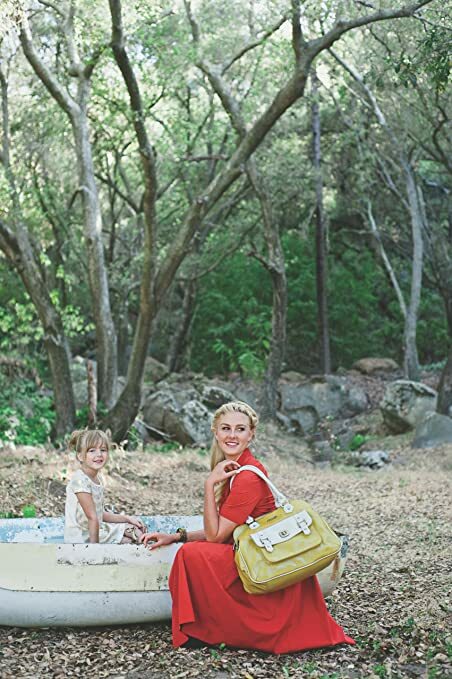 Some great choices in really cool, chic and usable diaper bags. If you need a Dad Diaper Bag….click here for some awesome choices.